Best Free Multiplication Games That Help Kids Become Good At Multiplying. Free multiplication games are just the thing to motivate kids to get excited them about learning teat at multiplying! Practice multiplication facts through 12x12. Happy multiplying!!! 1. Shuffle all the number cards and pass them out so that each player has the same number of cards. Players place the cards face up in front of them. 2. Players roll the 4 dice to decide who goes first. The player with the lowest total starts. 3. The first player rolls all 4 dice. He adds dice with the same color together to obtain factors. Then he multiplies the two factors. 4. He writes the factors, a multiplication fact, and the answer on his paper. He reads this equation to the other players. If they agree with his answer, the player looks at the cards in front of him. If he has the 63, he flips it over. Then he rolls again. All players get two rolls on each turn, whether or not they flip a card. 5. If at any time someone disagrees with the player’s answer, she may challenge the answer. She checks it with the calculator. If challenger is right, the player’s turn is over, and the challenger wins an extra turn. 6. Players continue to take turns rolling the dice, adding to find the factors, and multiplying the factors to find the products, and writing the math sentence. 7. If a player has 3 turns in a row without a flip, he has the option of a “free flip.” He chooses any unturned card and writes a multiplication sentence on his paper that uses the number as a product. For example, if he wants to “flip” the number 132, he writes on his paper 11 x 12 = 132 and reads this to the other players. A player may not roll on a “free flip” turn. 8. Play continues until one player has flipped over all of his cards. He is the winner of the game. If your child or students are ready to move on and are looking for some fun with multiplying larger numbers, that's a good thing. Here's a fun 2-digit and 3-digit multiplication game. Of course division and multiplication go hand in hand. Knowing multiplication facts well helps with division facts. Here's a division facts game they'll enjoy as well. Looking for online multiplication games? 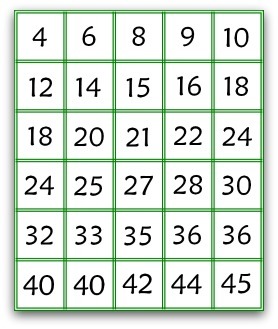 If you are a parent or teacher be sure to take advantage of the other free multiplication games we have on this site. We are adding more games on a regular basis. If you have any suggestions please contact us.